Posted on August 5, 2016 at 2:34 pm. 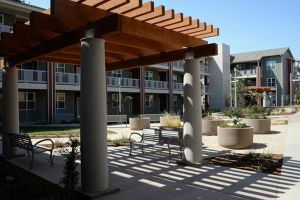 Ecovie and local partner Heat Transfer Equipment Company (HTE) are proud to have designed and commissioned a greywater system at the Mather Veterans Village near Sacramento, California. Using the Intewa AQUALOOP process with its commercial level NSF 350 certification, the system is designed to collect shower, laundry, and lavatory water from a 50 unit affordable housing complex for homeless and disabled veterans. Up to 1200 gallons per day of clean, treated water is available for use in grounds irrigation. The system is housed in two 1500 gallon underground fiberglass tanks. One tank acts as the AQUALOOP bioreactor, collecting water directly from the building and the other holds clean, treated water. 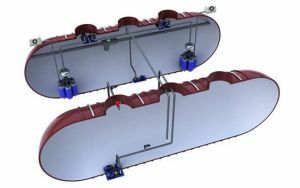 One advantage of the AQUALOOP design is that it can be put into a wide range of tank configurations, above and below ground, and does not require a separate catchment tank in many cases. Two full AQUALOOP membrane stations are used with a total of 12 membrane cartridges. This is a good example of how AQUALOOP is scalable to any size capacity from single family homes to large commercial systems capable of treating thousands of gallons per day. System control features full remote monitoring and programming developed by Bill McCabe at HTE. 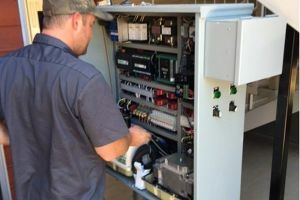 All aspects of the membrane bioreactor (MBE) including aeration, transfer, and membrane backwash are controlled in a central control panel which has an internet uplink. Equipment diagnostics, tank levels, and totalized flow are continually uploaded with alerts for any unusual conditions. The control approach will be the standard or all AQUALOOP commercial systems. An alternating duplex pump set up delivers clean water to a subsurface drip irrigation system for the landscaping. A valve opens automatically to supply city water in cases where no treated water is available. The AQUALOOP system produces water from greywater that is at near potable water quality. The only system certified commercial for NS 350, AQUALOOP has passed the stringent 6 month test with no maintenance which helps show just how reliable the process is. Click here for an overview of NSF 350. Ecovie and its partner firms would be happy to talk to you about your commercial greywater system needs. as with the Mather project, Ecovie can write the full system specification as basis of design and be your partner from engineering through commissioning and ongoing support. Contact for more details.